The latest Hosokawa GEN4,data driven manufacturing service will be demonstrated at Powtex 2018, Tokyo, by Hosokawa Micron Corporation: 28th – 30th November 2018. 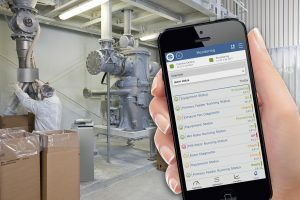 The service is designed to enable manufacturers to optimise production and processing performance through the application of industrial internet of things (IIOT)technologies. Hosokawa GEN4 provides a flexible toolkit to convert live data from sensors and controls into scalable and secure solutions to effectively address the challenges of dry end processing. Hosokawa Micron’s, Runcorn, Contract Processing Facility will provide a fully operational demonstrator enabling visitors to understand how the GEN4 technologies might support their businesses and a transition to smarter manufacturing. Iain Crosley, MD, says, ‘Our ability to support this international launch with real data, decisions and actions faced every day in the manufacturing of powders means visitors to the Powtex stand will realise a better understanding of the proven GEN4 potential for their own businesses’.